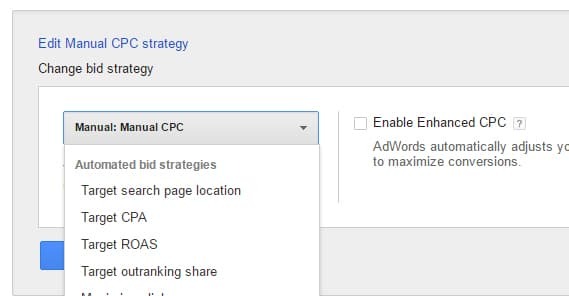 Google Ads Target CPA vs Manual CPC - Which Is Better? Google Ads, formerly known as AdWords, has a couple of different bidding strategies you can pick. They are essentially the difference between manual bidding and automatic bidding, though they have a little big of nuance you won’t grasp if that’s all you consider. Let’s talk about them, and the situations wherein each is better. Before we go too deep, though, I need to put an answer right up front. I know the title of this post indicates that one might be better than the other, but you should know by now that this is never going to be the case. If one strategy performed much worse than the other in every situation, Google would have long since killed it off. The fact that both still exist should tell you that they’re both viable, in different ways. Indeed, that’s my goal with this post: to tell you how each one can be viable, and help you pick the one you should use. The core of each option is pretty simple, so I can give you simple definitions of each. Manual CPC Bidding is, as the name implies, manual bidding. You select an ad campaign, an ad group, or an individual keyword for an ad, and you set the bid you’re willing to pay for that specific entity. It’s a sort of fallback option for when you’ve hit upon a strategy that the automatic bidding doesn’t replicate. It’s also an option for when you want specific control over everything, with no uncertainty. If you’re operating at the very limits of your budget and don’t want any undue surprises, manual bidding can help prevent any such surprises from cropping up. 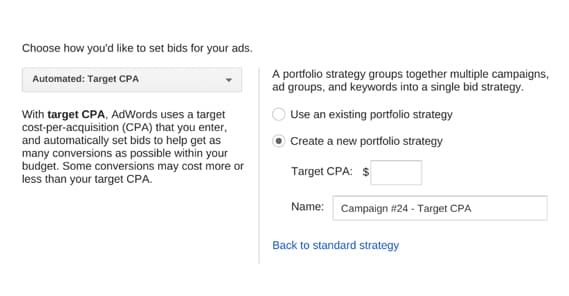 Target CPA Bidding is one of several “Smart Bidding” strategies offered by Google Ads. They also have target return on ad spend bidding, bidding to maximize conversions, and enhanced cost per click bidding. I’m mostly ignoring those other options for now. 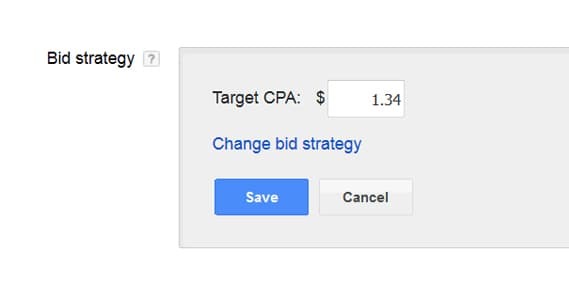 Target CPA bidding is an automatic smart bidding strategy that uses Google’s immense array of performance data to optimize bidding to reach a specific CPA. This can be useful if you may have a lot of conversions available at a high price point, but you want to target a lower price point and figure out what makes that audience different. Once you know what each bidding strategy is, you can determine when to use one or the other. In general, both can be fairly useful, even on the same ads as you adapt to data that comes in. As far as Manual CPC Bidding is concerned, it offers a much greater degree of control over your individual ads, ad groups, and campaigns. If you’re the kind of marketer who likes to make micromanagement changes to optimize every penny you put into your ads, manual bidding is the way to go. Manual bidding also works best when you’re trying to get as many clicks or simple impressions as possible. 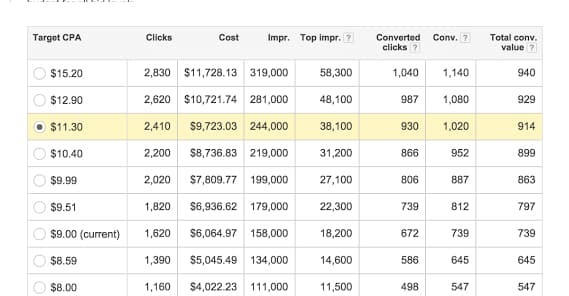 You can set the right level of cap to prevent the expensive, less valuable clicks, while spreading that budget to as many clicks as possible. Of course, if you’re an experienced marketer, you know that the sheer volume of clicks is not necessarily the best optimization strategy. It is, however, a good way to harvest a lot of data that you can then use for future optimizations, both in positive trends and in negative aspects to avoid going forward. For example, if you find that an exceptional number of clicks – with a very low conversion rate – are coming from a specific demographic, you can cut that demographic out of future ads. Manual CPC bidding is also a good option when you want to get impressions from a specific domain search, but don’t need to spend to get the top position for that search. Figure out a level of bid necessary to get a visible placement and go from there. Manual CPC is excellent for when you have a smaller, more limited budget. You can set lower caps than might be recommended by the automatic bidding engine, which lets you spread your money around more. This isn’t always going to get you the best possible return on your investment, as anyone who has bought cheap traffic from Fivver can attest, but again, it can get you data that you can use for future refinement of all aspects of your ads. Manual CPC bidding can work in reverse as well. If you have a high budget and want to maintain position in the top ranks, you can set a bid level adequate to reach that level. Automatic bidding has a tendency to cap your bid a little lower than you might otherwise like, in an attempt to save you money and spread that money out more without over-spending on those top spots. However, if you’ve done experiments and have determined that the extra expense is worthwhile in terms of conversions, setting the higher manual bid can be important. On the other hand, for automatic Target CPA Bidding, you can flip many of those on their head. It’s not quite opposite, but more of a complimentary situation. The way target CPA bidding works requires an initial investment. It’s an automatic bidding strategy. If you use automatic bidding for a brand new ad with no historic data, Google will be forced to estimate based on other similar ads in the past. Even very similar ads may have performed in very different ways, however, so this data won’t be accurate. Google will require your ads to reach a certain level of conversion, around 15 conversions, before the data is refined enough to make smart decisions. Therefore, automatic target CPA budding is less effective when you’re running brand new ads, but more effective on ads that have some data behind them. Automatic bidding is useful for when you have a specific target CPA you want to reach as well. For example, if your CEO decides that he doesn’t want to pay for conversions if they’re over a certain cost, you can set that as your cap for automatic CPA bidding, and it will prevent you from over-spending on your conversions. The other situation where target CPA bidding is better is when you have an immense number of ads you’re managing. Large businesses with old ad accounts may have racked up thousands, tens of thousands or even hundreds of thousands of different keywords and targeting factors for a vast array of ads. Even the best, most effective marketer is going to have a hard time micromanaging the manual CPC bid for every one of those keywords. It’s infinitely more effective, in a time investment standpoint, to set automatic CPA bidding for such a large expanse of advertising. This way, you can have most of your ads managed automatically, and handle the outliers with manual bidding. In fact, my recommendation is to start every ad with manual bidding, then once it has reached a certain conversion level, make a decision. If it’s a moderately effective ad, switch it to automatic bidding. If it’s not performing up to par, cull it and start over. 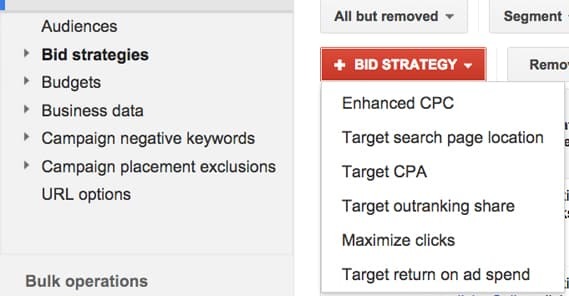 There’s no reason to set automatic bidding to optimize an ad that isn’t performing before you begin, right? Remember that Google has access to all of the data recorded for all of the ads ever run through the Google Ads platform. That’s an incredible amount of data. 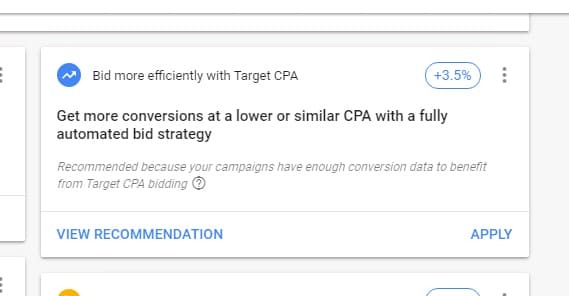 Google uses it to inform the decisions of their automatic bidding, but they also use it to recommend bid caps and bid levels for ads you’re starting to create. Should you trust those recommendations? I say yes, to an extent. Google knows a rough level where your ads will perform, but the numbers aren’t always going to be ideal for you. You might want to set a slightly higher cap, up to 15-20% higher than Google’s recommendation. A higher cap will allow you to obtain more initial data, which you can use to refine your ads moving forward. On the other hand, you may want to set a cap of up to 15-20% lower than the Google Ads recommendation. Why? If you have a limited budget, or if you want to analyze specifically the cheaper end of your ad spectrum, setting a lower cap will give you the data you need without over-spending. It’s very easy to accidentally set too high a bid cap and blow through a budget in a few days instead of a few weeks. Due to the way the auctions work, costs can vary quite a bit even within specific bid ranges. It’s best to set what you’re willing to spend, and allow the system to charge only what you’re able. Don’t over-spend on the assumption that you’re going to get usable data or effective customers out of it. Often, you just end up raising your average cost per customer acquisition. Speaking of adequate data, how long should you run manual bidding before switching to automatic? Most recommendations I’ve found indicate that you want to let manual bidding run for about a month. For high volume, high bid keywords, you may consider a faster switch, so long as you have enough conversions. 15+ conversions will give you a good baseline, though if you’re operating on a larger scale, you want considerably more. If 15 conversions is a few hours of ads for a your large business, it’s not likely to be an adequate sample for informing future ads. Let them run a while longer before you switch over. I mentioned in passing that there are other bidding strategies. Let’s briefly talk about each. The smart bidding option includes more than just target CPA bidding. You can also target a specific return on ad spend, which is very useful if you have a variable value for a single conversion. You can optimize for those larger orders rather than the volume of smaller orders you might otherwise get. You can also target to maximize conversions rather than optimizing costs. This is a great option for when you want as many conversions as possible and have the budget to support it, but it’s a terrible option for limited budgets who want cheaper conversions. 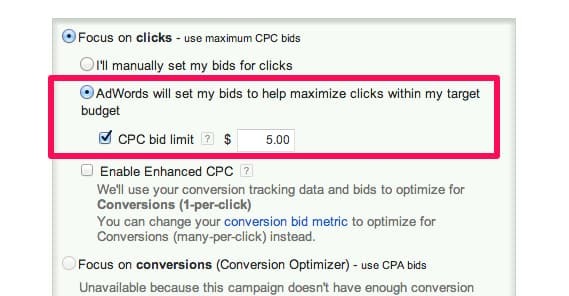 There’s also an enhanced cost per click bidding, which works sort of like manual CPC bidding, but done by the Google algorithms instead of your own manipulation. This can be a good way to split the difference between the two options, but might not be as effective as your own manual bidding strategies. You can use a bidding strategy to maximize clicks as well. As the name implies, this will get you as many eyes on your landing page as possible, but is more of a CPM strategy than a CPC strategy. It gets you as many clicks as possible for your budget, but doesn’t care if those clicks result in conversions. For obvious reasons, this can be less than effective. Google Ads also have a series of options for impression-focused bidding. You can bid to target a specific position for ads, including just the top spots, or the in-search rather than sidebar positioning. You can also choose a specific competitor’s domain you want to out-rank and bid to out-rank them. This can work well if they’re working on a limited budget, but has the potential to run out of control if you both set each other as out-bid strategies. This will maximize both bids until one reaches their cap, which can waste a lot of money. There are also the typical CPM options, including a target CPM or a viewable vCPM, both of which are only useful when you want eyes on your ad, but don’t really care about clicks. If you have a very, very compelling ad, this can be a great option, but more often than not a CPA or CPC strategy will work a lot better. When Does Google AdWords Charge Your Credit Card?